MTSU professor, recent grad ho..
Public invited to MTSU's sprin..
A producer of hit records, a civil rights trailblazer, panel discussions and social gatherings are all part of MTSU’s 2019 celebration of Black History Month. “The Black Migration” is the theme of the university’s salute to black contributions to the human experience. The “black migration” describes a period of American history in which African-Americans fled from the South to other parts of the country between 1916 and 1970 to find economic opportunities and freedom from the oppression of Jim Crow laws. The official Black History Month kickoff is set for 11 a.m. to 1 p.m. Tuesday, Feb. 1, in the Student Union Atrium. Event organizers are inviting the university for cake and information about upcoming activities. 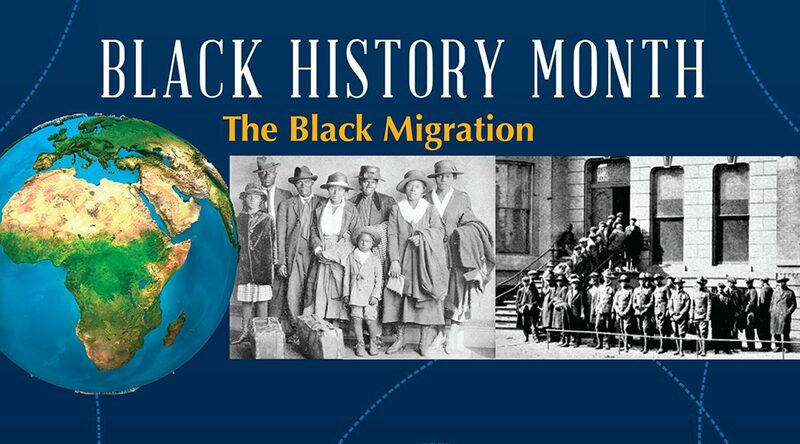 A panel discussion on the topic of “The Black Migration” is slated for 6 to 7:30 p.m. Tuesday, Feb. 5, in Room 220 of the Student Union. James Meredith, the first African-American to attend the University of Mississippi, will headline the 23rd annual Unity Luncheon Thursday, Feb. 14, in the Student Union Ballroom. The event is set from 11:30 a.m. to 1:30 p.m. Tickets are $25 for nonstudents, $15 for students and $350 for a table of 10. Tickets are available online only through Friday, Feb. 1. A roundtable discussion with Meredith is set Feb. 14 from 2 to 4 p.m. in Room 224 of the Student Union. The featured speaker for Black History Month is Grammy Award-winning music producer and recording artist David Banner. His address is planned for 7 p.m. Thursday, Feb. 28, in the Student Union Ballroom. In 2006, Banner turned his attention to acting. His film credits include “Black Snake Moan,” “Stomp the Yard: Homecoming 2” and “Lee Daniel’s The Butler.” Banner also is the founder of A Banner Vision, a multimedia company that provides music for television commercials, video games and films. • The third annual Color the Runway Fashion Show, sponsored by MTSU’s Black Student Union and the student chapter of the NAACP, set 6 to 9 p.m. Friday, Feb. 8, in the Student Union Ballroom. • “The Social Hour,” two hours of socializing with local African-American entrepreneurs, sponsored by Alpha Kappa Psi Professional Business Fraternity Inc. from 6 to 8 p.m. Monday, Feb. 11, in Cantrell Hall in the Tom Jackson Building. Information on prominent African-American businesses from the 1900s until the present day will be available at this networking opportunity. • Presentation of the John Pleas Faculty Award to Dr. Frank Michello, a professor of economics and finance, at 4 p.m. Thursday, Feb. 21, in the Ingram Building, 2269 Middle Tennessee Blvd. The Pleas award is given each year to an outstanding black faculty member. • A performance by more than 100 female high school singers from Rutherford County of works by composer Rosephanye Powell of Auburn University, under Powell’s direction, at 7:30 p.m. Thursday, Feb. 21, in Hinton Hall in the Wright Music Building. A campus map is available at http://tinyurl.com/MTParkingMap. Off-campus visitors attending daytime events can obtain a special one-day permit at www.mtsu.edu/parking/visit.php. With the exception of the Unity Luncheon, Black History Month events at MTSU are free and open to the public. A complete calendar of events is available here. 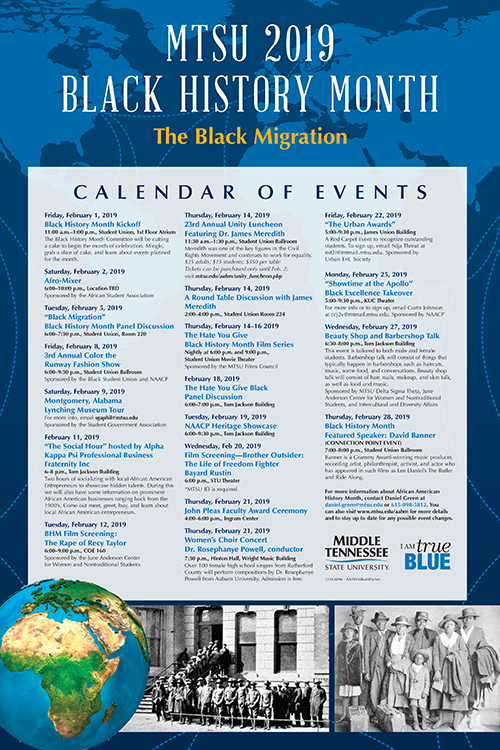 For information on more Black History Month events, visit www.mtsu.edu/aahm or contact Daniel Green, director of the Office of Intercultural and Diversity Affairs and chair of the university’s Black History Month Committee, at 615-898-5812 or daniel.green@mtsu.edu.